We are proud to announce the release of our LALD series low drift linear servo amplifiers. These linear servo amplifiers offer unmatched performance in terms of overall drift over the operating temperature range. With less than 400uA of drift, worst case, from 0 to 70 degrees C, these amplifiers offer over 100x drift improvement over prior models. With their true linear output control, these amplifiers eliminate the radiated noise and distortion typically found in pulse width modulated (PWM) servo amplifiers that can cause undesired motion and interference in high resolution noise sensitive motion control applications. The LALD series of transconductance Linear Servo Amplifiers are now available in 6 power levels from 500W to 3800W, with up to 40 amps peak output current. These current mode servo amplifiers are well suited to drive a wide range of inductive loads such as brushless and brush servomotors or voice coils. They are ideal for driving low friction air bearing stages due their inherent stability and up to 20kHz bandwidth. Bus voltage has been increased over prior models, allowing up to +/150VDC operation. The design of these amplifiers includes our exclusive “Safe Operating Area” protection that monitors output power in real time and protects the amplifier from destructive over-power conditions. The on-board DSP monitors all key system functions in real time and provides an intelligent user interface that allows setup and storage of all system parameters via a serial interface. Non-volatile memory provides storage of the parameters during power off conditions. Due to the low drift design of these amplifiers, no balancing or calibration is needed once they leave the factory. They are inherently balanced for all operating conditions. 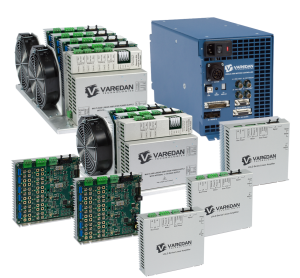 Varedan Technologies designs and manufactures custom and standard motion control products such as servo drives, stepper drives and motion controllers for OEM applications. Visit us on the web at www.varedan.com.